Insurance companies offer a diverse range of products to meet the specific requirements of their customers. 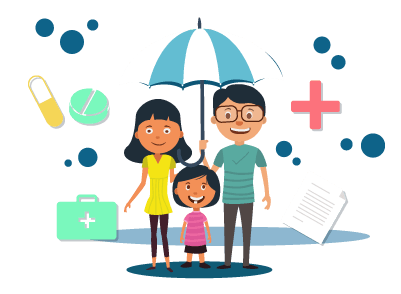 While term plans are exclusively intended for protection, there are other life insurance plans like endowment plans, ULIPs, retirement plans, whole life insurance plans, etc. The main purpose of these plans is to combine the benefits of insurance and investment under a single policy. Exide Life Insurance is one of the top life insurance companies that offers various policies under different categories. The company is still one of the up and coming firms in the life insurance industry. However, it is increasing its customer base throughout the country with the help of its diverse plans. Choosing the right insurance cover from the hundreds of plans available in the market is no easy task. Most people research various products before choosing a plan ideal for them. Since cost is one of the major factors to be considered, premium calculators play a major role in helping customers find the right plan. The cost of life insurance is based on various factors like age, income, sum assured, smoking habits, health condition, etc. When customers input these details into a premium calculator, it will give them the exact amount they must invest to get the desired coverage. Through this way, premium calculators are extremely helpful in the decision-making process with regard to life insurance. On the homepage, click on the menu labelled ‘planning tools’. Here, you can find various tools like investment calculators, child education requirement calculators, retirement calculator, risk analyser, etc. Choose the tool you wish to use and input the required details. For instance, if you are using the retirement planning tool, you must input details like your current age, age at which you wish to retire, current expenses, inflation rate, desired growth rate, etc. This will help you find the exact amount you will need after your retirement. Following this, you can choose the plan and find your investment amount based on the investment goal you wish to achieve. Click on the specific plan in which you wish to invest. Once you have reached the plan page, click on the section labelled ‘how this plan works’. Here, you must enter various details like the number of years you wish to be covered, your date of birth, and amount of premium you are willing to pay. Based on the details you have given, the plan will calculate the benefits you will receive at the end of the policy term. Premium calculators help customers when they wish to compare multiple products available in the market. By comparing the products available for them, customers can pick the right product suitable for them. Premium calculators are essential in helping customers improve their knowledge about various life insurance products. By calculating how much they can get after the policy term, customers can make better decisions on various investment goals. Premium calculators save time by eliminating the need to reach out to the insurer to get a price quote for every product. Customers can check multiple options by changing the sum assured amount as per their budget. Buying a life insurance policy is one of the major decisions you might encounter in your lifetime. Hence, it is important to choose the right policy that is in line with your specific investment goals. Premium calculators help you achieve this by helping you understand how much you have to receive to get a specific amount in return.